Johns Hopkins University Press, 9781421417325, 304pp. It seems like every time a new mother turns on her computer, radio, or television, she is greeted with news of yet another scientific study about infancy. Ignoring good information isn't the right course, but just how does one tell the difference between solid studies, preliminary results, and snake oil? In this friendly guide through the science of infancy, Science of Mom blogger and PhD scientist Alice Callahan explains how non-scientist mothers can learn the difference between hype and evidence. Readers of Alice's blog have come to trust her balanced approach, which explains the science that lies behind headlines. 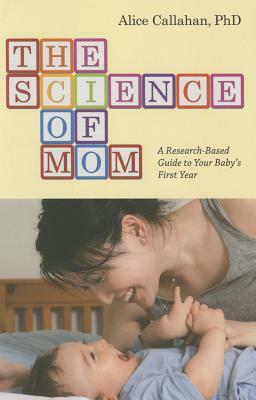 The Science of Mom is a fascinating, eye-opening, and extremely informative exploration of the topics that generate discussion and debate in the media and among parents. From breastfeeding to vaccines to sleep, Alice's advice will help you make smart choices so that you can relax and enjoy your baby. Alice Callahan holds a PhD in nutritional biology from the University of California, Davis, and spent two years investigating fetal physiology as a postdoctoral scholar. After giving birth to her first child in 2010, she put her scientific training to work answering the big questions of caring for a baby. The creator of the blog Science of Mom: The Heart and Science of Parenting, she writes and teaches in Eugene, Oregon. Finally, someone has brought some science―and some sense―to the mommy wars. Should be required reading for all new (and old) parents. Alice Callahan has written a breakthrough book, combining the compassion, warmth, and angst of a mother with the measured reasoning of a scientist. She helps parents not only understand how science works, but how they can access that science to answer their questions. She's found a way to access the scientist in all of us. Yes! An easy-to-read, fascinating, nuanced review of the science behind new parents' biggest health questions. Many of these issues―infant sleep, breastfeeding, vaccines―have or will hit your 'Should I panic?' button. With gentle guidance, Alice Callahan puts your fears to rest. Families routinely search for health information. The Science of Mom makes it easy collecting evidence for health decisions and putting it into perspective with a mom-to-mom connection. Callahan's advice is thoughtful, backed by science and feels fueled of love. She is willing to provide powerful advice when detailing the science and safety of vaccines. Keep this book in arm's reach as you support your infant for calm and direction. Fascinating! Think of all the controversial, hot-button topics that parents obsess about in a child’s first year―from vaccines and feeding, bed-sharing to sleep training. Weighing the scientific evidence, Callahan offers balanced insights and in-depth answers―a far cry from the oversimplified advice prescribed by many 'parenting experts.' The result: a must-have guide that’s substantive and extremely engaging.